Parking: $5 to $20 for the day depending on location. There were lots of thundering noise, and lighting quick action in the sky above Windsor over the weekend of August 29-30 courtesy of the Windsor International Air Show. It was a blast to see Capt. Tim ‘Donor’ Woods in the CF-18 rocketing into the sky. The crowd watched the combined precision flying of Capt. Woods as he took the CF18, rolling only a few hundred feet above the tarmac, accompanied by the Hawk One F-86 Sabre and the CT-144 Centennial Tutor in formation. The spectacular flight, celebrating The 100 Years of Flight in Canada. The Canadian Forces had a great presence over the sky at the Windsor air show with the Skyhawks Parachute Team and with the famous Snowbirds. 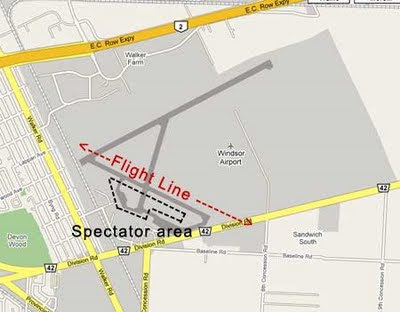 The Windsor air show has been dormant for several years, and has been started up once again in 2009. The Windsor International Air Show is not to be confused with the Red Bull air races, held too, at Windsor annually. However, Michael Goulian, one of the performing pilots from the Red Bull series of events, who just come back from winning the Red Bull air race at Budapest, did participate in the air show. 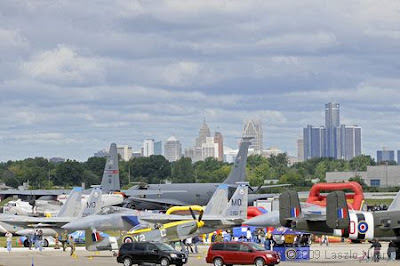 The Windsor International air show was a great place to spend some time, to see, and learn about different aircrafts, and it was also a place to honour Canada’s War Veterans. The directing team of the air show, and their volunteers has to be congratulated for organizing a very good air show, giving their welcome and hospitality to the Kids Kick Cancer on Friday, and recognizing the Veterans throughout the weekend! There were a good selection of static aircraft from the US, representing the USAF and Navy. Such as a rather unique ex Hurricane hunter C-130 Hercules, a KC-135R Tanker, a rarely seen C-2 Greyhound, and (4) four F-15C Strike Eagles, (too bad they did not perform!!). There were the usual no-shows due to maintenance issues or other related difficulties, but even without them, there were about 40-45 aircraft on the tarmac, including the WWII B-25 Mitchell, and a P-51D Mustang. In addition to the static aircraft, one could look at some antique cars, and some WWII vintage armor displayed near the Veterans area. There was also a WWII Avro Lancaster bomber, undergoing restoration on display by the hangar of the Canadian Historical Aircraft Association, along with the de Havilland D.H.98 Mosquito, wooden superstructure. For real historical aircraft buffs, these were planes to see. The weather, unfortunately, was not cooperating much during the event. On Friday it rained heavily, and the Snowbirds had to cancel their practice due to this. Saturday started off with dark overcast clouds early in the morning, but cleared rather quickly, giving plenty of sunshine. The clouds returned however, and they provided a dramatic and very photogenic background to photograph the aircraft performing in the show. Sunday, it was very dark, chilly and very windy in the morning. Toward noon it started to clear, and the remaining clouds were not as dark, but it was still unseasonably cold, and windy. To photograph the aircraft with a larger lens was a challenge due to the wind shear on the lens. The layout of the show was well laid out, with plenty of flight line view available for the attendees and aspiring photographers. There were adequate food concessions (some from catering trucks) and the sanitation facilities were well spread out. The performances ranged from very good to excellent. On Sunday the Snowbirds had to switch #3 to #10 just as they were about to take off, which delayed their performance, and cancelled their fly-by with the Hawk One. Despite the delay, their performance dazzled the crowds. I would like to thank the following people who made me feel welcome and their hospitality was much appreciated: Keith Baxter – Director of Operation, Theresa Baxter – “Chief of Everything,” Bill Reilly – Media Operations, Brad Saunders – Ground Boss, Mike Beale of the Canadian Historical Aircraft Association, Lt. Errol McKenzie, Airport Security and his team. In addition, I wish to thank Capt. 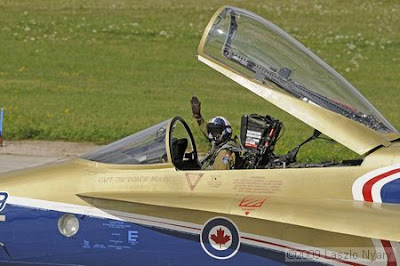 Tim Woods and his CF-18 Demo crew, and Capt. Cregg Wiebe, Snowbirds pilot who flew the Golden Centennaires Centennial CT-144 Tutor for their gracious cooperation. Over all, the Windsor International Air Show was a very good show. While it was not the biggest air show this year in Canada, it was so far, one of the best, earning them a well deserved 8.75 out 10! Two exciting outdoor aerial events are set to take place this month at the museum. The Giant Scale Radio-Controlled Model Aircraft Air Show will happen Sept. 4-6 from 8:30 a.m. to 5 p.m. each day. From Sept. 25-27, the World War I Dawn Patrol Rendezvous comes to the back field, bringing early air power to life. Click here for detailed information. Celebrate fall while learning about gravity during this month's Family Day on Sept. 19 from 10 a.m.-3 p.m. Visitors will have variety of aerospace stations to choose from that demonstrate the force of gravity. One station will explain how parachutes work and will allow participants to try on a real parachute and to sit in an actual B-2 ejection seat. Other activities include storytime and an opportunity to make a paper parachute. Visit the Family Day page for more information. The U.S. Air Force Band of Flight's largest performing ensemble will present an exciting evening of music. The program includes Joseph Wilcox Jenkin's popular "American Overture for Band," an original composition by the band's staff arranger, Staff Sgt. Scott Wise, based upon the tune "This Land Is Your Land," as well as "Battle Hymn of the Republic," sung by Staff Sgt. Terra Mason. The free concert takes place Sept. 12 at 7:30. Click here for more information. Dr. Thomas D. Jones, a veteran NASA astronaut, scientist, speaker, author and consultant, will speak about a book he co-authored with Robert F. Dorr called "Hell Hawks! : The War No One Told You About and the Heroes Who Helped America Win It" on Sept. 23 at 7:30 p.m. Click here for more information about the book and the authors. Registration for this fall's Home School Day will open on Sept. 1 at 9 a.m. Those interested in participating can learn more by visiting the Home School Day page here. Activities and classes are available for all grade levels from preschool through high school. Space is limited, so register early! On Nov. 10, 1942, the C-47 nicknamed The Flying Dutchman (S/N 41-18564) hit a strong down-draft over the Owen Stanley Range while carrying U.S. Army troops from Port Moresby to Pongani, New Guinea. It crashed into the side of Mount Obree, killing seven of the 23 onboard and destroying most of the food it carried. Of the 16 survivors, eight received serious injuries and burns. Twenty-five years later, the crash site was rediscovered and on a door was scribbled the daily experiences of those survivors who were never rescued. Click here to learn more about this new exhibit in the Air Power Gallery. While aboard the presidential C-54 aircraft, Sacred Cow, in July 1947, President Harry S. Truman signed the National Security Act of 1947, officially establishing the United States Air Force as a separate service under the National Military Establishment (renamed in 1949 the Department of Defense). On Sept. 18, 1947, Stuart Symington was sworn in as the first Secretary of the Air Force by Chief Justice Fred Vinson, establishing the United States Air Force as truly an independent arm of the U.S. military. For further information, visit the USAF Established page. Today I attended the Radom Airshow which was supposed to have been the biggest military airshow in Poland. Sadly at around 1.30pm this afternoon an SU-27 took off in front of the crowds and after a short display, lost power and crashed into the ground at the rear of the airfield behind some trees, killing both pilots. The aircraft was on loan from the Belarusian Air Force and was one of the highlights of the show. No-one yet knows what happened, but I saw the aircraft go down and there was seemingly no attempt by either pilots to eject. The highly-trained and skilled pilots risk their lives every time they fly these multi-million dollar jets and when something goes wrong, the effects happen very quickly. 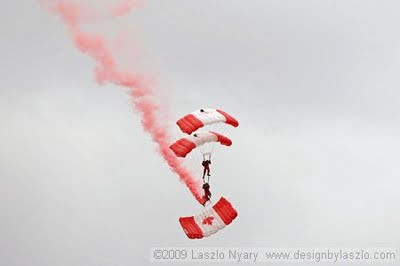 At the last Radom Airshow in 2007, two pilots from Team Żelazny were killed when their aircraft collided in mid-air. May the pilots rest in peace. Click for more photosA British pilot is recovering in an Ottawa, Ontario hospital after the vintage Tiger Moth he was flying crashed shortly after takeoff from nearby Gatineau Airport on Friday. Howard Cook suffered some broken bones and lacerations and underwent surgery to repair the damage and is expected to make a full recovery. The aircraft is part of the Vintage Wings of Canada collection, which is owned by Canadian businessman Michael Potter and it's the first crash of one of the faithfully restored aircraft in the collection. Vintage Wings of Canada pilot Dave Hadfield (whom AVweb interviewed in a P-40 cockpit tour video made at AirVenture Oshkosh last month) said in a podcast interview that Cook is a passionate vintage aircraft pilot who flies for the famed Duxford Museum in England and is an associate pilot with Vintage Wings. Hadfield said Cook is the consummate pilot and his first question was about the condition of the aircraft. Howard Cook, a British pilot visiting Vintage Wings of Canada in Gatineau, Québec, is in the hospital recovering from injuries suffered in the crash of the collection's Tiger Moth last Friday. Vintage Wings volunteer pilot Dave Hadfield spoke with AVweb's Russ Niles about the accident, Cook's condition, and the organization's response to the mishap. There's been nothing written (that we can find, anyway) about an accident involving the New Standard biplane used for giving rides at Old Rhinebeck Aerodrome, but this video, posted on YouTube about 10 days ago, tells quite a tale. According to the reader who sent us the YouTube link, the accident reportedly happened July 26 and, from the video, appears to be an off-runway excursion into a nasty ravine filled with big rocks. As might be expected, the off-roading takes a toll on the wood and fabric but doesn't seem to have banged up the pilot and his passengers, one of whom kept the camera rolling through the whole accident and aftermath. There is no NTSB report on the mishap, and FAA incident reports are only available for the last 10 business days. The museum's web site says only that biplane rides are suspended until Labor Day weekend, but it's not clear whether the crash airplane will be fixed or a replacement found for rides. This Week In Military/Aviation History 31 August - 6 September from Warbirds Online by Tom Kwiatkowski Sr.
Hello Folks, sorry about being MIA for the last few weeks. I had an emergency gall bladder removal, but I’m feeling much better now, thanks for asking. Let’s get down to some serious history, shall we? The only airport, I think, where drivers would't be trying to "beat a train," but rather a plane. Click on each photo for larger size. If you can't make it to Reno - here's your alternative! For our email readers, click the link above to this post and you can see the video! ... The jet was performing maneuvers at the festival in Radom, 65 miles south of Warsaw, when it went down this afternoon. The unexpected visit of the Patrouille de France has materialized this afternoon in Quebec City, with an air show colorful above the St. Lawrence at the Chateau Frontenac. Thousands of people moved yesterday to attend a real ball Air Patrol of France, who gave a stunning performance by decorating the sky over the capital with colors of blue, white and red of the Republic French. In all, the elite pilots have offered a dozen figures, some with a daring breathtaking. The three former Women Air Force Service Pilots who retired to South Florida were among the more than 1,100 female pilots who logged 60 million miles in non-combat missions between 1942 and 1943. Their primary mission was to protect U.S. coasts, freeing up male pilots to fight combat missions abroad. The National Waco Club held their 50th Annual Fly-In back in June and these pictures were just sent to me. Over 100 quality pictures of some rare and beautiful Wacos. The Northwest Art & Air Festival is in its 10th official year, though balloons have been launching in Albany — now from Timber-Linn Memorial Park — for several years longer. Other festival events include artist demonstrations, biplane rides, concerts and food vendors. The event continues through Sunday. "I was a farm boy and I got to join the Navy. It was awesome," said Wayne Johnsen, one of 113 World War II veterans from South Dakota who visited the memorials this weekend through the Honor Flight Network. I think it'd be pretty hard to find a modern military aircraft that's stirred up more controversy than the V-22 Osprey. Sure, the F-22 is expensive and much of its role arguably obsolete, but it's still the best damn air superiority fighter in the world. Uncontrolled Airspace #151 "Midnight in the Morning"
Amy Laboda visits the virtual hangar this week. She and the boys talk about some crazy flight situations... Jack goes on a very Dave-like rant... and they eat some crow. All this and more on Uncontrolled Airspace, Episode #151 "Midnight in the Morning"
The 2009 Offutt Air Show will be held in Bellevue, Nebraska on August 29-30, featuring the Blue Angels. £10,125 raised for Children in Need in 2008 - details here! Flying tales have amazed and delighted readers since Icarus took Flight, including the online story of Canada's youngest bush pilot, Guy Cannon. Shoreham Airshow 2009 on Flickr - Photo Sharing! 2009 Air Show now less than a month away! The Mohawk Pilots Are Coming to Chino!